Now days a problem is that people need laptop, tablet, computer, phone and camera all devices at a same time and all these smart technologies are not found in a single place, but now a company FUJITSU solve this problem. They recently design and invent such a device called Fujitsu LifeBook in which all the latest techno devices are combine in one place, means now you can find all above listed things in one single slim smart package at a time. This laptop contains a smart digital camera in back, which is removable, means you can remove it from laptop back if you need only camera to use. 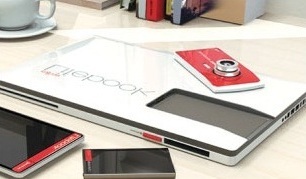 For typing this lifebook laptop use a smart small tablet, means as soon as the tablet is in the slot, the tablet itself becomes a full size touch-based QWERTY keyboard and for sketching or as a another screen for gameplay it transforms. Tablet interfaces with the laptop by a slot with a 16 pin connector. As soon as the tablet is docked into the slot, a sensor senses the operation and the tablet itself becomes a full size touch based QWERTY keyboard. Also as soon as the tablet is plugged in, it starts sharing its hardware and data to, either contribute towards improving the performance of the laptop or, in some cases, even to run few functions of the laptop completely on its own. In a similar way, the phone + music player is also completely integrated inside the laptop and through a connector, starts sharing hardware and data as soon as it is plugged in. These all parts also works separately and also is connectable with each other. This is a design and on the basis of it a Media Hub is also be possible which can fulfill all the digital requirements of any person. 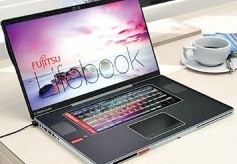 It can completely change the lifestyle, and according the designer of Fujitsu Lifebook that its further attractive features make it more glorious. And it is also be cheaper if you buy these smart devices separately, so that you can save your money and space by buying this glorious technology. This device also helps to make it user’s life more smart and simple. great post...I loved it !!! how and from were i can buy?